I never thought I’d say it, but returning to Hong Kong was like returning home (at least for the time being). Check out the aftermath of spring break – my group of girlfriends wasn’t the only one with some tales to tell that’s for sure! I had another interesting week post-spring break, although not quite as exciting as the two weeks prior to it – man, mainland China was such a trip! Don’t worry though – things most certainly never got boring. Let’s begin where I last left off. We (and everyone else) had just gotten back from trips across all parts of Asia. All of the people who were in Thailand over spring break while the red shirts were protesting and rioting in Bangkok got out safely, thank God, and we ended up trading sickness, injury and malady stories while recounting our exciting adventures. According to my detailed and painstaking calculations, about 92.85% of the exchange students who went somewhere within Asia for spring break got either food poisoning, stomach flu, what Lonely Planet guidebooks call “Traveler’s Diarrhea” (which encompasses virtually every kind of indigestion or stomach related illness you can think of) or a general cold. We were all pretty physically destroyed after spring break, to say the least. 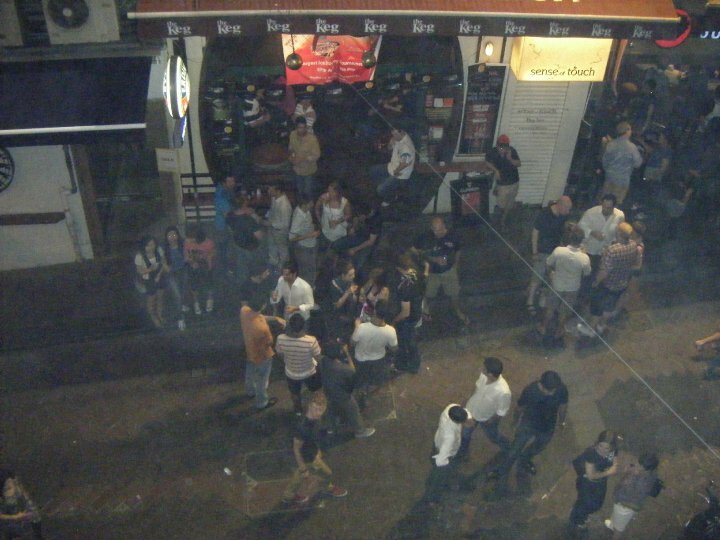 The bustling street scene on an average night in LKF. Also, the weather wasn’t too great for most of the week. I really wanted to go out on Thursday night because I hadn’t been to LKF (the clubbing district) since before spring break, and even though the four of us wanted to go clubbing in Shanghai, by that point in the trip, two or three girls were down for the count by the time each evening rolled around. So I wanted to go out, but the weather was so nasty – cold (again! ), misty, windy – just terrible. I really wondered where this warm, humid weather I’d heard so much about was supposed to be – come on Hong Kong, but on Friday things finally did start to perk up a bit. I ended up going out with a smaller group of people than normal because one of Abby’s roommates from our home university Emory who was studying abroad in London came home to Hong Kong (yep, she grew up there) to visit during her spring break, and brought another friend with her. At the same time, Jen’s parents from Estonia arrived in Hong Kong, and went to Sanya (a resort island in China) on Friday morning, taking Jen with them. My little group went out though, ran into a bunch of other HKUST students while out and about in LKF, which was still as much fun as ever, and although the demographics were slightly more skewed towards the older crowd on Friday nights than on Thursdays, it was still a great time. I danced till I couldn’t dance anymore, took a cab home and collapsed into bed at 5 AM. 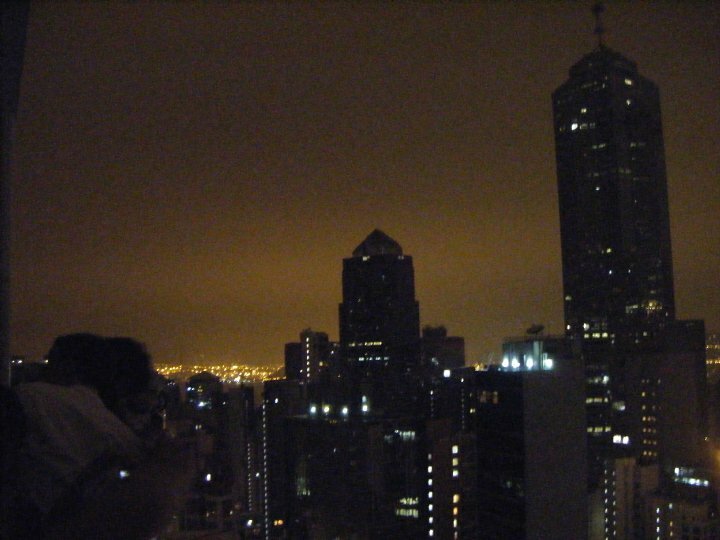 A view of the Hong Kong skyline from one of the clubs in LKF. 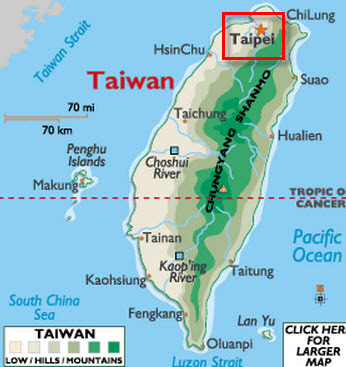 Saturday, I did a little research into Taiwan; I and a few other exchange students decided we would like to visit there as our last hurrah of traveling in Asia right before the semester ended. Our plan was to go between when classes ended May 13th and when finals began May 20th (who needed to study anyway? ), and we were going to book plane tickets that night for Taipei from the 14th through the 18th. I’ll be honest, I was already so excited about it! I couldn’t wait to see Taiwan firsthand, although if I could have I would’ve liked to prevent the semester from ending indefinitely. I was thoroughly enjoying myself and all of the people I’d met in Hong Kong so much, that I really didn’t want it to end. Ever. Better if I just tried to avoid thinking about it altogether, things got messy and complicated and sad when I dwelled on the thought too long. But anyway, a group of us decided to go off campus for dinner that night to a nice supermarket in Hung Hau called Taste, where they had all these pre-prepared dishes – sushi, noodles, octopus balls, roast chicken, tofu, etc. that you could buy pre-prepared and then take home to eat. Our first order of business was to buy dinner then take it to a nearby restaurant in the mall, sit down and start eating, only to be shooed away by the people working at the restaurant telling us the tables were only for paying customers. Fine, be that way. We took our half eaten sushi rolls, chicken legs, noodles, and other goodies and ended up sitting in the McDonald’s seating area getting strange looks from the kid busing tables and people walking past as we ate, but whatever. We’re foreigners. The food was good, the company was good, and it was nice to be off campus for a change – that was the first time I had been off campus since coming back from China except for the night in LKF. Stick around for my next post when I went from hiking to sailing in no time flat. How many people can say they did that while playing hooky? This entry was posted in Asia, Hong Kong and tagged Asia, Dance, Hong Kong, LKF, Spring Break, Taiwan, Travels on April 11, 2014 by Paige N..